-3- La Raza, for the majority of us, has become mestiza, so that many of us only seach our Spanish heritage for our identity and purpose. Yet the pure raza, who rightfully claim to be true Americans, looks no more favorably on Spanish than on other Europeans. If in fact we are mestizos, it is our obligation to go back beyond our Spanishness to the pure raza in order to gain a greater perspective of ourselves. This is not to say that we will denounce our Spanish strain, as the pure raza might; we should however increase our ability to come to grips with our total identity. Our mestizaje should cause us to ask toda, who and what is la raza? The European invasion interrupted the psychological, physical, cultural and social development of la raza. Any answer to the question of who or what la raza is cannot be complete unless we understand American life prior to the European invasion. Part of the Answer can be found in statements from Anahuac. Any investigation will be valueless unless its findings can be related to and given meaningful interpretations for la raza's modern predicament. 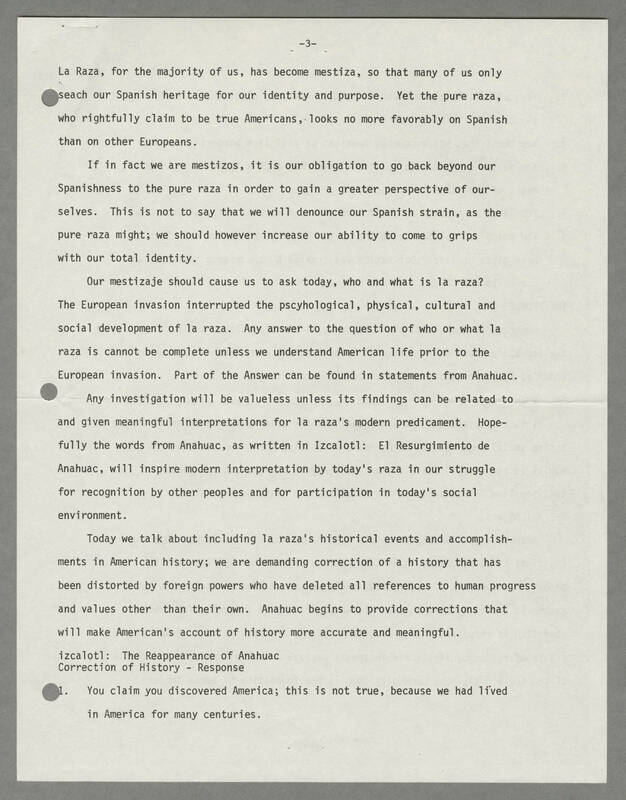 Hopefully the words from Anahuac, as written in Izcaltol: El Resurgimiento de Anahuac, will inspire modern interpretation by today's raza in our struggle for recognition by other peoples and for participation in today's social environment. Today we talk about including la raza's historical events and accomplishments in American history; we are demanding correction of a history that has been distorted by foreign powers who have deleted all references to human progress and values other than their own. Anahuac begins to provide corrections that will make American's account of history more accurate and meaningful. izacaltol: The Reappearance of Anahuac Correction of History - Response 1. You claim you discovered America; this is not true, because we had lived in America for many centuries.